Jefferson Hall _What is Agua Salud? Video of Jefferson Hall _What is Agua Salud? The Panama Canal Watershed is perhaps one of the tropics' clearest examples of ecosystem services in action. The basin’s fresh water transports four percent of seafaring world trade, generates $2.5 billion in annual revenue and sustains one of the fastest growing economies in the world today. 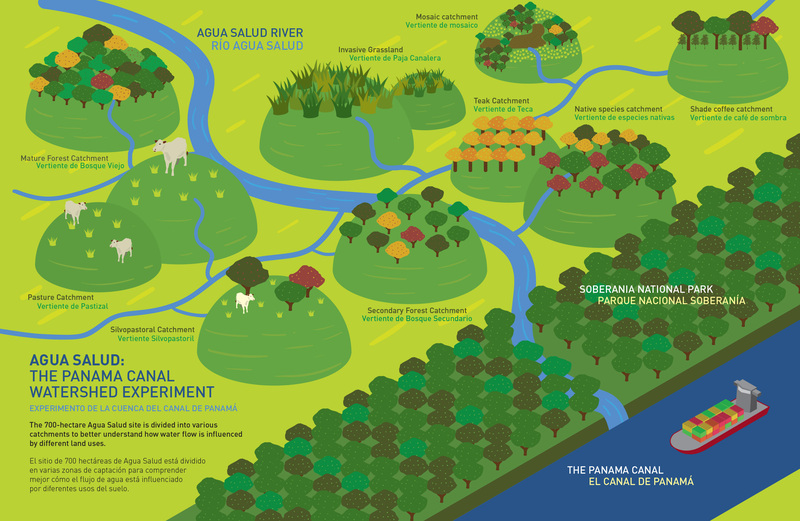 Named for the Agua Salud River, the 700-hectare Panama Canal Watershed Project seeks to explain how different landscapes common in the rural tropics — from intact forests to cattle ranches — impact ecosystem services in an era of exploding population growth, ecosystem degradation, and global climate change. Agua Salud’s experimental plots include native tree plantations, silvopastoral and shade coffee systems, invasive grasslands, subsistence farms and forest regrowth ranging from a few years to many decades in age. Figuring out the hydrology of the basin — essentially accounting for every last drop of water that passes through it — is a primary goal of the project. Reforestation with native species, carbon sequestration, biodiversity restoration and disease ecology are also part of one of STRI’s fastest-growing research platforms. The research aims to inform policymaking decisions that have implications for billions of people throughout the tropics. The project’s large-scale reforestation and mixed-use experiments attract researchers interested in facets of landscape regeneration ranging from economics to the restoration of biodiversity. No water? Or too much water loss? The United States develops a system of headwater river gauges and rain gauges in the what was then the Panama Canal Zone. Today, the Panama Canal Authority has 30 river gauges, 10 lake gauges, more than 70 rain gauges, 20 complete meteorological stations, and twice-daily weather balloon soundings, along with weather radar. High-quality topographic mapping data are available from multiple sources. Preceding the handover of the entire canal area to Panama, the U.S. Agency for International Development (USAID) funds STRI to consult as the Panamanian government establishes an environmental monitoring program in the canal basin, with a focus on monitoring the effects of deforestation and urbanization. The project launches with significant support from the HSBC Climate Partnership and the first tree saplings planted in research plots. To date, the project has planted more than 140,000 trees in an experimental design that makes it possible to address a wide variety of questions related to reforestation. Silvopastoral and shade coffee plantations are added. Major expansion of physical monitoring system begins. The project attracts more and more international research groups studying hydrology, carbon modeling, biodiversity monitoring, microbial biology and disease ecology. Agua Salud staff helps with orientation of potential new investigators and helps. A steady influx of new scientific visitors and research projects make Agua Salud one of STRI’s fastest-growing research sites. Resources are still limited but there is housing near the research site some transportation available. Visiting researchers are usually based out of STRI’s Tupper Center headquarters, where Agua Salud’s administrative staff and laboratories are based. Making the 50km commute between Tupper and Agua Salud is one option for visiting researchers. Agua Salud’s experimental catchments are the foundation of the project’s research program. These include catchments of near-mature forest, managed forest, and secondary succession forests of various ages. There are also native timber plantations that are mixed-species or monoculture, and a teak plantation. Farmed landscape includes silvopastoral and shade coffee systems, and mixed-use subsistence lands including business-as-usual cattle ranching. Invasive canal grass also covers a catchment area. Agua Salud’s sophisticated system of hydrological data collection builds on more than a century of monitoring in the Panama Canal Watershed. Along with a standardized system of gauged weirs to measure stream flow, the hydrology research measures water flow through soil at different depths, runoff, and water use by trees — sap flow and transpiration. The objective is to create physics-based models that can be applied to current and future conditions across a variety of landscape uses. Variables measured by the project’s meteorological stations include rainfall, temperature, wind speed and direction, relative humidity, solar radiation and net radiation. Some stations collect and transmit data in real-time. The project rents two houses in the nearby town of El Giral. Both sleep up to six people in shared rooms. They have shared bathrooms, kitchens and a furnished common area. Internet service is spotty. Food can be purchased in town but it is probably best to stock up at a supermarket in Panama City before settling in. The project lies roughly 50 km northwest of Panama City in Colón Province and can be reached by either via Transisthmian Highway or the toll road to Colón. To access the site, turn west at the town of El Giral, just north of the Chagres River. Reaching the field sites usually requires a 4x4 vehicle. Road conditions during the dry season are typically okay but rainy season access can be limited. Transportation should be arranged by visitors and visits coordinated with the project manager.